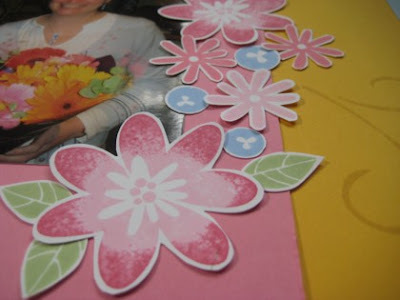 Fiona stamps ...: Scrapbooking with Stampin' Up! 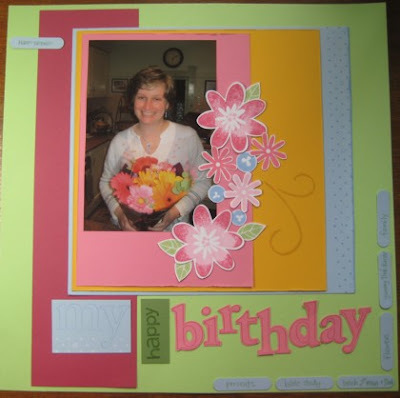 All this time I've been enjoying making cards with Stampin' Up!, and scrapbooking when the mood takes, but not using the SU products so much for scrapbooking, for some reason (hmmm maybe my sizable stash of scrapbooking supplies has something to do with that!). Last night I sat down and created these 2 quick pages using only SU products and boy - was it quick and easy. No fiddling round matching colours and embellishments - yey! 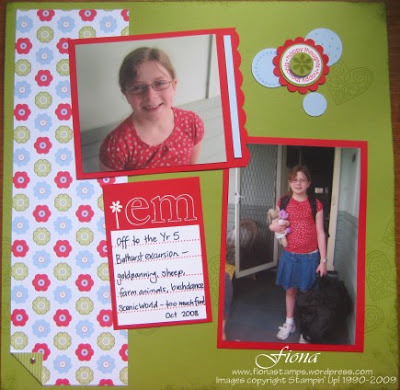 This sweet paper was from the Spring mini catalogue, it matches well with Emily's red t-shirt. I loved the Bold Outline Letters with white EP, they came out so fine but readable. 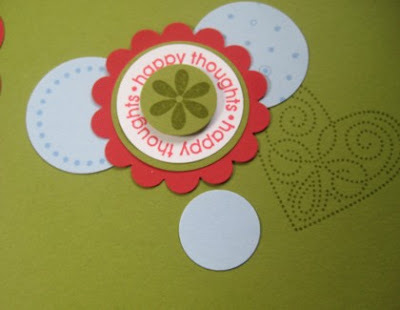 Embellishing was easy with a few dotty stamps from different sets, and the scallop circle punch. The other page was a bit more colourful, taking inspiration from the beautiful flowers Steve gave me for my birthday. Of course the Bodacious Bouquet was a natural choice for this page. I rocked and rolled the large flowers and used colours from the photo, and I love how it turned out! The word window punch was great for journalling. hmmmm ... looks like I'll be reaching for my Stampin' Up! supplies much more often for scrapbooking from now on!